Fast, quality fax transmission. With a 33.6Kbps Super G3 Fax Modem, the FAX-8360P allows quicker faxing of office documents via a reduced up to 2 second transmission speed, improving office efficiency and reducing transmission costs. Faxes are transmitted in a high quality format thanks to the available 64 levels of Grey Scale, with very small print and fine line drawings presenting no problem with the innovative Super Fine function. Quick dialling. Fax numbers of key contacts, clients and suppliers can be programmed into the machine’s expansive memory using the available 32 One-touch Dial Keys and 200 Speed Dial Locations, enabling quick dialling of regularly used numbers. Secure use. 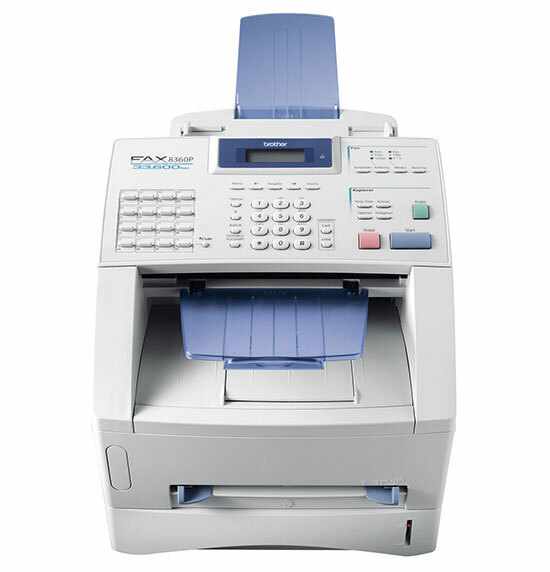 Any unauthorised use or access to the FAX-8360P’s faxing, copying and programming functions is halted by the inclusion of a user-defined PIN number, with incoming faxes stored in the memory and only printed when the secure mode is deactivated. Convenient document sending. For added ease and convenience when sending longer outgoing documents, the FAX-8360P automatic document feeder allows you to send up to 30 pages at any one time. Efficient multi-tasking. For the ultimate in office efficiency, the FAX-8360P dual access feature allows documents to be loaded into the machines memory whilst other faxes are sent or received, with those stored documents being sent as soon as the line becomes free, easing office congestion. Superior copying performance. Not only does the FAX-8360P offer superior fax functions for your corporate office environment, it also has a range of useful copying functions that will prove indispensable. The FAX-8360P offers a copying speed of up to 14cpm at a high quality 600 x 300 dpi resolution, and also enables you to make up to 99 copies of each page loaded into the ADF. The machine also offers the useful function of being able to compress 2 or 4 pages onto a single sheet and reduce or increase the size of a single document from 50% to 200% in 1% increments. Paper capacity. The FAX-8360P offers up to 250 sheet paper capacity as standard, although this can be increased to up to 500 sheets with an optional extra paper cassette, for long lasting paper supply in high receive environments. Memory. The FAX-8360P has a standard 8MB memory capacity, allowing up to 4 days memory back-up, up to 500* page memory transmission or up to 500* pages out of paper reception. However, this can be expanded to up to 40MB with optional 16 or 32MB DIMM cards, increasing performance even further.